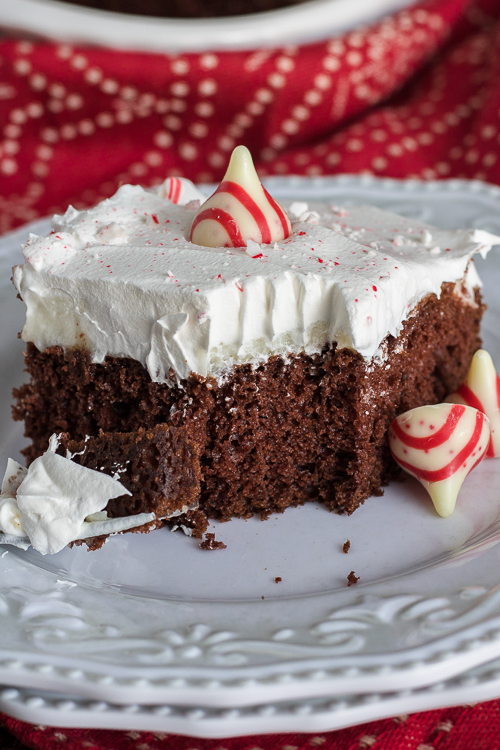 Chocolate peppermint cake, a holiday poke cake made from Devil’s food cake, white chocolate pudding, and peppermint! You all are in for a treat today! First off, have you ever tried or heard of a poke cake before? Basically, all you do is make a cake, literally poke holes in it then pour something liquid-y on top so the cake soaks up all that goodness! 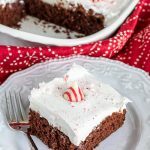 For this chocolate mint cake recipe, I made it poke cake style and my filling of choice is instant white chocolate pudding flavored with peppermint extract… oh yea! When the cake is still warm you make the pudding and before it is set you drizzle it all over the cake and holes. The pudding will seep down into the cake making it super moist! I topped it with whipped topping, or you can use whipped cream as well. 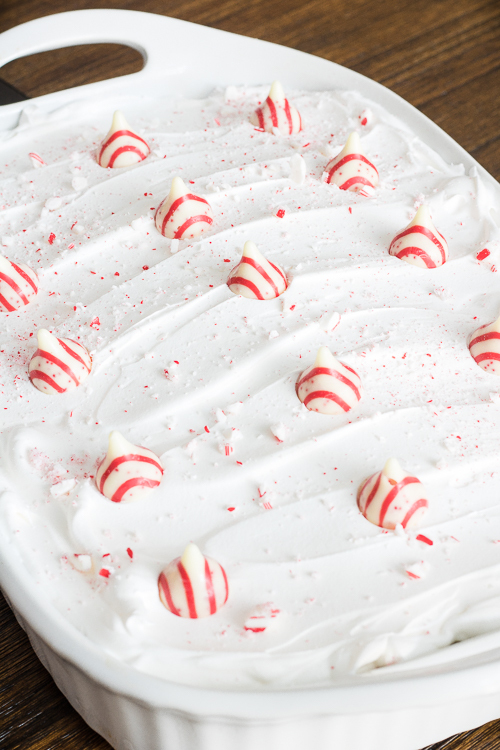 Then, just a garnish of candy cane kisses and chopped peppermint right before serving and you have one show-stopper! Isn’t it so pretty! OH SO DELICIOUS, wow!! Don’t worry the peppermint doesn’t overpower any other flavors, it’s a light and refreshing touch! Start off by making the cake batter, I cheated and used a store bought Devil’s food cake mix. But, feel free to use any chocolate cake recipe that can be baked in a 9×13 baking dish. When the cake is done baking, let it cool for about 10 minutes. Taking a skewer or the round end of a spoon or utensil, poke holes all in the cake about 1 inch apart. Make instant pudding mix by combing white chocolate pudding packet, peppermint extract, and cold milk. Mix per directions and immediately pour all over the cake, do not let the pudding set up. Cover with plastic wrap and place in the fridge for 3 hours to chill. 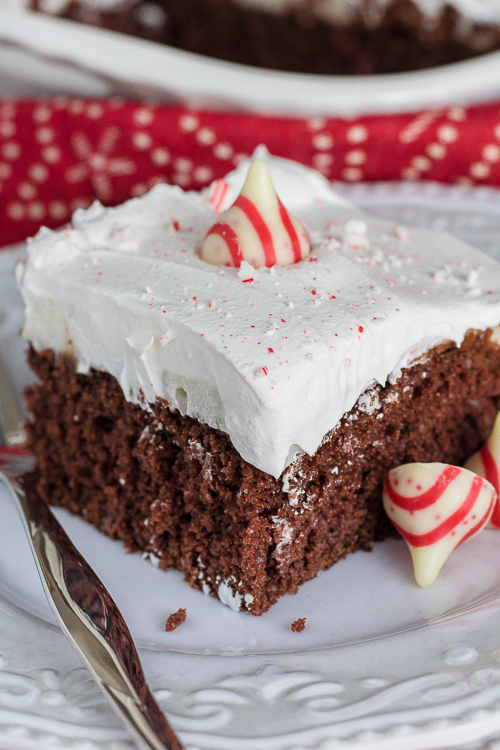 Before serving top with whipped topping or whipped cream and garnish with candy cane kisses and chopped peppermint, enjoy! I poked smaller holes in this cake because I like when some of the pudding sits on top of the cake for a nice layered effect. If you like it more when the pudding seeps down in larger amounts, make sure to form bigger holes! 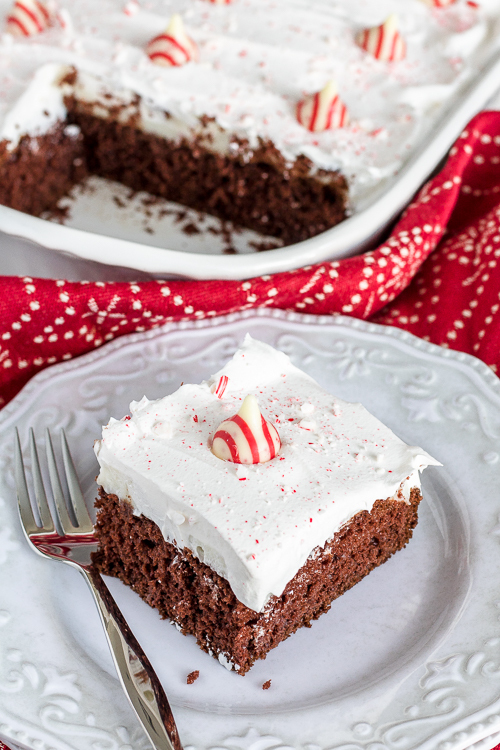 How easy is this chocolate peppermint cake?! And so beautiful. For even more yummy inspiration please visit my blog https://ThisSillyGirlsKitchen.com for more recipes, see you there! Preheat oven to 350 degrees. In a large bowl, add the cake mix, water, butter, and eggs. Using a hand mixer, mix together for 30 minutes until there are no dry spots. On medium speed mix an additional 2 minutes, scraping the sides as needed. Pour into a 9x13 greased baking dish. Bake for 26-31 minutes until a toothpick inserted into the middle comes out clean. Place on the counter to cool for 10 minutes. Poke holes through the cake about 1 inch apart using a skewer to make small holes or a round end of a utensil to make larger holes. While the cake is cooling, make the pudding. In a medium-sized bowl, all the pudding mix, milk and peppermint extract. Using a hand mixer, carefully whip together for 2 minutes until slightly thickened. Immediately pour pudding over the cake, making sure to try and get the pudding over all the holes. Smooth with a spatula. Cover with plastic wrap and let sit and chill in the fridge for at least 3 hours. Before servings, top with whipped topping and smooth out with a spatula. Decorate with chopped peppermint and candy cane kisses if desired.